This light worked really well in my model home. The finish is as pictured and I like the rutic look that it gives. I am very happy with the purchase. 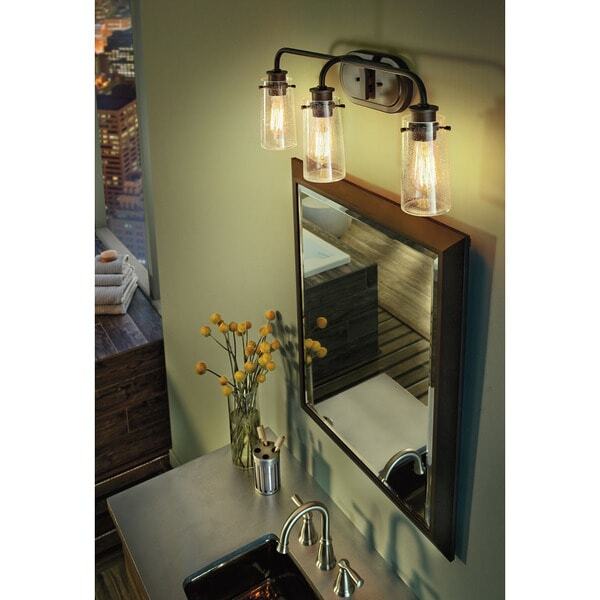 This Braelyn collection 3-light bath/vanity fixture features an olde bronze finish that will complement many urban, loft, and transitional decors. The clear seedy glass shades allow the light to bounce in different ways and will add interest to any space. There's so much to love about the reclaimed style of the Braelyn collection. The vintage industrial design is punctuated with clear seedy glass shades, reminiscent of glass jars that were a staple of 19th century American life. The olde bronze finish and carbon filament replica light bulbs enhance this style. Olde Bronze finish with Clear Seedy Glass shades. May be installed with glass Up or Down. Fixture Dimensions: 10 inches high x 24 inches wide x 7.25 inches deep. I have a tricky bathroom that has rustic matte brown tile and a massive expanse of shiny blue flecked black granite for the vanity. I needed a light fixture that toed the line between sleek and rustic. This turned out to be perfect. The lines are clean but the the seeded glass and olde bronze finish are rustic. Of course you have to use Edison bulbs which is an added expense but so worth it. I bought two for over our dual sinks and since I purchased mirrors that "hang" by a big rope (Harper Blvd Winslow Decorative Wall Mirror- also on overstock), I actually hung these fixtures upside down. I'm not sure they are meant to go either way, but they look fine. One important detail: the screws that go through the circle bracket that stick out from the wall that you hang the actual fixture from are about a half inch too long, so you when you put the little decorative screw covers over them, you have a ton of silver showing and the fixture sags off the wall. And by then you have already wired and to fix it you have to unwire it all, unscrew the bracket and replace the screws (which were the first step of the whole process). So do yourself a favor and get regular length fixture screws (for some reason, I had tons of these left over from the multitude of fixtures I have installed in the past) and use those from the start. I would have deducted a star for that reason BUT I had to give back a star for the FABULOUS customer service I got from Overstock. Both of my boxes each had 2 identical holes in them about the size of a man's thumb. And the way they are packed, the bolts that hold the glass globes in are not in the hardware bag but screwed into the spots where they go in in the fixture (the globes are not attached, they are well packed separately in styrofoam). In one of my fixtures, one of the bolts was missing and not anywhere in the package. In the other box, there was one loose, but it was still in the box at least. I theorize that in the first box, somehow the bolt fell out of one of the holes. I contacted customer service and they offered me a partial refund via PayPal if I could figure out a way to fix it without any further assistance from them, but honestly, it's a specialized part and it's not like you could buy one *** , so I asked if they could replace it and a few days later I received a package with a whole bunch of them. I was so pleased because I sure didn't want to have to take them down and pack them up and send them back. Beautiful light fixture! Purchased for my current home, which I just sold, and will be purchasing it again for my new home's powder room. Love it! Installed this in our guest bath and it is super cute. I like how the three pieces to the fixture wasn't flat across the front like most. The middle light sticks out slightly farther than the end lights, so this worked well over my mirror that is arced on the top. I love my new vanity light. Have several Kichler lights in my home. Would recommend this brand to anyone! This is a cool industrial bathroom light. It’s of good quality and was easy to install. I would recommend this light. Looks great in the bathroom! Great quality, easy installation, fast shipping, overall very happy with this purchase. It completely changes the look of the room by providing a bit of character that many vanity lights don’t provide. Love this light, absolutely beautiful ! These lights are extraordinarily beautiful & look stunning in our new modern farmhouse home ! The style is so unique & love that no one else has anything like them! Would highly recommend!! This was a great buy for my living room. It’s got a nice industrial look and soft light with Edison bulbs. We purchased these vanity lights for our bathroom renovation and they look great. I’m very impressed with the quality. We’re considering purchasing two more for my sons’ bathroom. Great addition to the bathroom. Instand makeover guaranteed. You do need Edison bulbs to finish the look. Installation was not a breeze but we managed.